Tampa Bay Lightning star Steven Stamkos broke his tibia on Monday. Tampa Bay Lightning forward and offensive powerhouse Steven Stamkos broke his tibia after crashing into the goal post while playing against the Boston Bruins as part of the Bruins’ Veterans’ Day game on Nov. 11. The impact on Stamkos and the Lightning is obvious, he is out three to six months, according to bleacherreport.com (watch the GIF here), and the team is without its leading scorer. But Stamkos’ injury affects more than just the Lightning, it affects all of hockey. Mainly, the National Hockey League is without one of, if not the most, natural goal scorers in all of hockey. Stamkos’ name may not be as well known as Sidney Crosby’s, but the man can score goals. He scored 60 of them during the 2011-12 regular season and was tied for the league lead with Alex Steen at 14 goals so far this season (check out hkref.com for Stamkos’ full career stats). Simply put, Stamkos is a joy to watch play hockey. He is Brett Hull-like in his ability to find open space. His shot, whether it be a slapper, wrist or snap shot, is a thing of beauty – all youngsters out there should try to emulate him. Plus he loves scoring so much it’s contagious. It’s a pity that fans around the league won’t be able to see his talent till his return. Even worse is the fact that he may very well miss the 2014 Winter Olympics in Sochi, a platform in which hockey fans worldwide could watch him score again and again. Team Canada will be fine since it’s, well, Canada…obviously. The Canadians are stacked with talent. 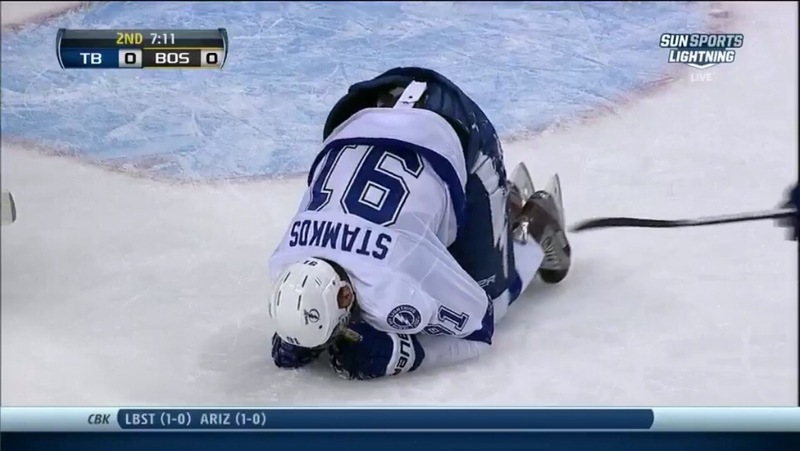 As hockey fans, we here at The Hockey Ref can only hope for Stamkos’ speedy recovery. We love watching him play, as long as it’s not against our favorite teams. So have at it Steen, the stage is set for you to show us what you’ve got and win the scoring title this season. Check out Yahoo! Sports for a video of his injury and obvious pain afterwords.